From the late 16th Century until the early 18th, high heels were a men's fashion, and then a unisex fashion trend in Europe. Then, slowly, high-heeled shoes fell out of favor for men. As the BBC reports, the story of how heels became popular and why is one of Orientalism, gender, power, and privilege. It turns out that it all started because of the Persian military. High heels make riding into battle easier: unlike a potentially slipper flat-soled shoe, a heel is something the wearer can hook into the stirrup for stability when riding in adverse conditions. That makes it easier to do things like fire your bow while galloping towards an enemy army. The Persian army under Shah Abbas I had some of the most fearsome cavalry in the world, and when the Shah sent the first Persian diplomatic mission to Russia, Germany, and Spain in 1599, it started a fashion trend for heeled boots. Persian style shoes were enthusiastically adopted by aristocrats, who sought to give their appearance a virile, masculine edge that, it suddenly seemed, only heeled shoes could supply. As the wearing of heels filtered into the lower ranks of society, the aristocracy responded by dramatically increasing the height of their shoes — and the high heel was born. By the 1630s, women's shoes were growing heels — part of a wider trend for men's wear influenced styles, including touches like epaulets (the "boyfriend jeans" of their day, apparently). These newly popular styles had wide, stacked heels for engineering reasons. This was centuries before the discovery, allegedly by Roger Vivier, that adding a skinny steel shank to a high heel would allow a body's weight to be carried on a heel no wider than a pencil. 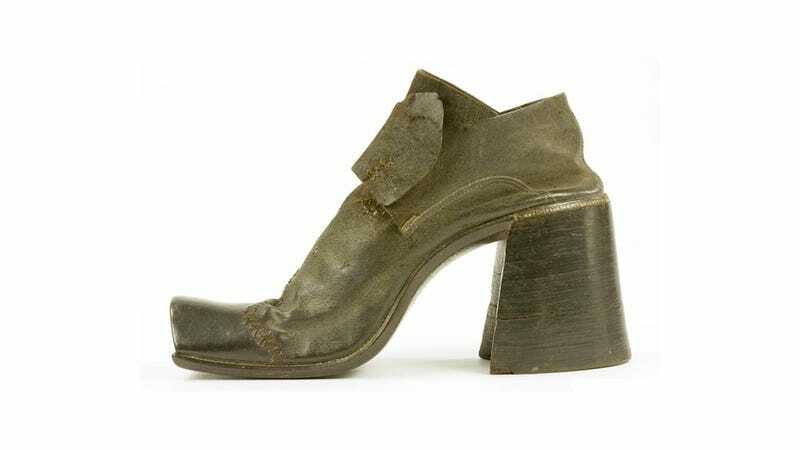 But though the heel shape was different, the heights involved could be quite comparable to those of modern women's shoes: Louis XIV added 4" of height to his 5'4" frame by wearing heeled shoes. Louis XIV also started a trend for wearing shoes with heels that were painted red. (After that caught on among the plebs, he changed France's sumptuary laws to restrict red-heeled shoes to members of the royal court.) Charles II of England's coronation portrait depicts him wearing red-heeled shoes. The many reasons why high heels are often derided by men today — their impracticality, the fact that they can restrict the wearer's movement, and their discomfort — were precisely the reasons why men of privilege considered heels desirable in the 17th Century. "One of the best ways that status can be conveyed is through impracticality," says Elizabeth Semmelhack of the Bata Shoe Museum in Toronto. Fashion is always a kind of non-verbal communication, and wearing heels was a way for a man (or, later, a woman) to silently establish that he wasn't obligated to perform manual labor or even to walk long distances. It was the beginning of what has been called the Great Male Renunciation, which would see men abandon the wearing of jewellery, bright colours and ostentatious fabrics in favour of a dark, more sober, and homogeneous look. Men's clothing no longer operated so clearly as a signifier of social class, but while these boundaries were being blurred, the differences between the sexes became more pronounced. "There begins a discussion about how men, regardless of station, of birth, if educated could become citizens," says Semmelhack. "Women, in contrast, were seen as emotional, sentimental and uneducatable. Female desirability begins to be constructed in terms of irrational fashion and the high heel — once separated from its original function of horseback riding — becomes a primary example of impractical dress." Semmelhack believes that if women achieve equality in their power and social status with men, men may start wearing heels again. "If it becomes a signifier of actual power, then men will be as willing to wear it as women."